December 2, 2015 – The Salt Lake City Council yesterday passed the 2015 version of the Bicycle and Pedestrian Master Plan. The document has been in development for two and a half years, and had input from stakeholders and citizens throughout Salt Lake City. The 125 page document contains vision, maps, and programs that will guide Salt Lake City bicycling for the next 20 years. The previous version was the 2004 Bicycle and Pedestrian Master Plan. Of particular note are the maps for planned bikeways in Chapter 6. These include a low-stress bicycle network that includes the backbone protected bikeways of 300 South and 200 West. 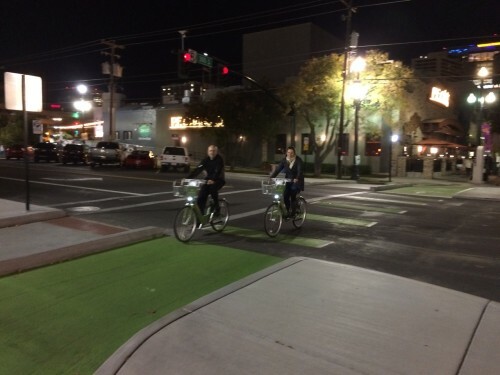 These show the future for cycling infrastructure within Salt Lake City. Additionally, the plan contains programs for reducing bicycle theft, bicycle data collection, bicycle friendly businesses and areas, recreational bike routes, wayfinding, school bike trains, bicycle education, winter cycling, and women's cycling. The Salt Lake City Council held a public hearing on December 1, 2015. Comments were mostly positive. A motion was made to close the public hearing and then vote on the plan on December 8. A substitute motion by Councilperson Erin Mendenhall was made to suspend the rules, and to pass the plan that evening. Charlie Luke then made substitute motion to delay the plan for a few months until the new administration was seated in January. Mendenhall then made a substitute-substiture motion to pass the plan with two additions to alleviate concerns about a trail to the northwest of the airport, and to define the term Active Transportation (bicycling, walking, and human powered transportation). The plan passed on a vote of 5-2. Councilpersons Rogers, Mendenhall, Luke Garrott, LaMalfa, and Penfold voted for the motion. Councilpersons Adams and Charlie Luke voted against it. The trail to be removed from the plan was planned to go through a utility corridor to the connect the northeast area of the airport to the International Center. The trail would have gone through sensitive wildlife and bird habitat. Representatives from the Audubon Society, and from property owners in the area including the duck clubs objected to the trail being included. The trail may be revisited and studied, but given the constraints, it is not likely that a trail will be built in the area due to airport security and wildlife preservation. The Transportation Division will add the final edits to the plan in December. Most bicycle planning in Salt Lake City is done through the Transportation Division. Implementation of the plan is ongoing, and programs and bike lanes will be rolled out as resources permit.